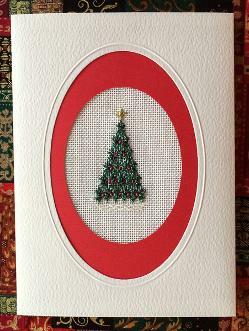 I love Christmas and all the old fashion ideas that surround it which include sending Christmas cards. 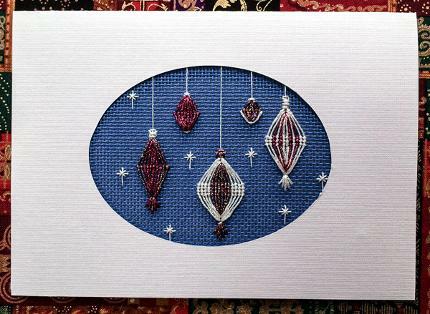 How I would love to send each and everyone of my friends a hand stitched card! But, alas this does not get done. However, I do send out a few to special people each year. On the following pages are pictures and pdfs of twenty different cards for you to download and want share with a special friend. 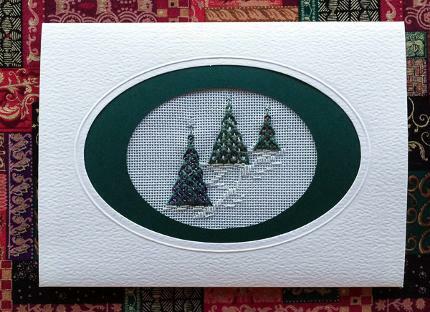 I have 2017's card - Etoile de Noel ready for you to enjoy. You are welcome to stitch these in any colour you like. I love it when people share their ideas with me. 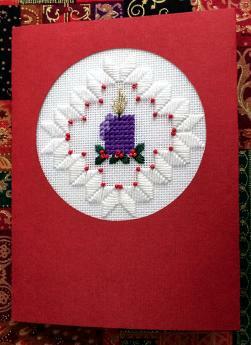 Below are some pictures of cards that have been stitched by the ANG Chapter - HEART OF CAROLINA. Enjoy!! 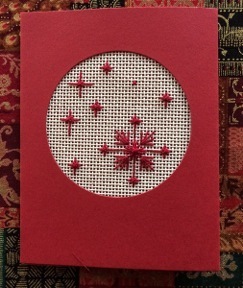 This is the 2000 card - SUZIE SNOWFLAKE all dressed up in red!! Isn't she delightful!! This is the 2001 card - FLICKERING FLAMES. I love the oval opening that is displaying this design. This is the 2013 card - WINTER WONDERLAND. The stitcher/finisher decided to put in an extra oval matting. WOW what a difference the mat makes! The first card I did was on a television show called Big Breakfast back in 1999 in Winnipeg. I called it TREE AT TOWN HALL. I still think it is a very pretty tree. The stitcher/finisher put the extra oval mat in for a cool finishing look! This is the 2015 card - CHEERFUL WELCOME. I love candles and how they flicker creating light in the darkness. I imagined them creating light through a lacy curtain window welcoming people to their home. The red cranberries or holly berries add colour and warmth. This is the 2011 card - CHRISTMAS DREAMS. As each Christmas arrives we decorate our homes. Each ornament brings a memory of a person or happening. We dream of yesterdays past, and share the stories with family. 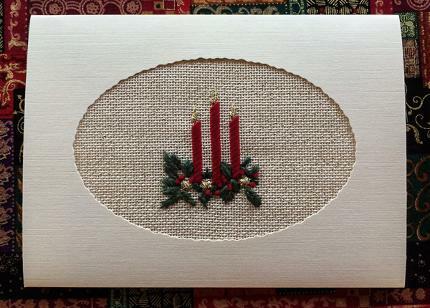 Each canvas background and ornament can be different from mine making this card truly your own as this stitcher did. It is so pretty and rich in appearance.